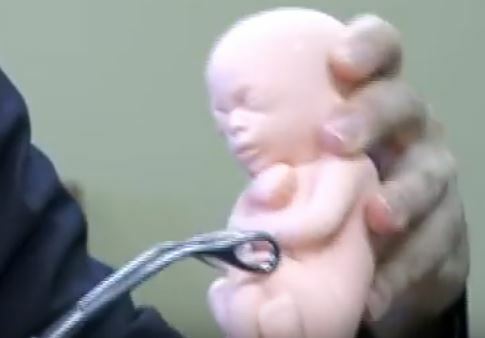 The abortion images below show some of the grim reality of abortion. Only seeing such images of abortion can bring us to the kind of indignation needed to sustain the sacrifices that will be necessary to finally bring an end to this injustice. We have been urging the mass media to show the American people what an abortion is by showing the pictures of aborted babies. Abortion is a reality which is so horrific that words alone can never convey its meaning. It’s especially critical to show people the images of babies aborted in the first trimester. It is in regard to such children, who constitute 90% of abortion victims, that the myth persists that they are not really children at all. Please use these abortion photos to show others this horrible reality. Gallery 1: Chronological Photo Index of first trimester aborted babies. Gallery 3: Photos of aborted babies at various stages, retrieved from dumpsters. Gallery 4: Photos of children killed in second trimester abortions. Gallery 5: Images of babies killed by abortionist Hodari and retrieved from dumpsters in Michigan in 2008. Gallery 6: The story and photo of Baby Malachi.